The former St Peter’s Roman Catholic Church at the corner of St Francis and St Dominique’s streets in Gouyave was built around 1810, on the site of an older church, and its Tower or Steeple as it is called by Gouyavarians, has been a local landmark ever since, as it dominates the Gouyave skyline, as seen from Palmiste as one approaches Gouyave from the south and presents a postcard vista of the town. Somewhere during the late 19th or early 20th century, a new and larger church was built further north on St Dominique’s Street, and the former church was converted to the Senior RC School up to about 1990, when it became too small to house the growing school population and was transferred to the Presbytery complex until 2002, when a new modern primary school was built at Middle River, Gouyave. For a short period after 2002, the building was used for storing nutmeg for the GCNA, but for sometime after Hurricane Ivan in September 2004 there was no longer any nutmeg to store. Hurricane Ivan, however, left its mark on the steeple, rendering it unsafe for public use, as pieces of metal from the leaning cupola or metal dome over the tower dangle precariously in mid-air. As most Grenadians would know, the weekly Fish Friday event occupies both St Francis and part of St Dominique’s streets which are in the shadow of the steeple, and therefore prohibits the use of the St Peter’s Church yard for Fish Friday “expansion,” as the Sentinel was given to understand. Just like Melrose House which the Sentinel recently brought to the attention of the citizens of Gouyave and to those who are concerned with our disappearing heritage, the Sentinel is also bringing to the attention of the public at large, the dire need for the repairs and restoration of the steeple. Although the entire historic building needs restoration, it is the steeple however, which requires immediate financial assistance to avert its collapse and the attendant collateral damage which could occur, including loss of lives. In this regard, there is a local organization in which Dr George Vincent is spearheading a fundraising drive, to undertake the necessary repair works. Should this be accomplished in 2016, it could be the catalyst to initiate a “heritage conservation area” from St Dominique and St Francis Streets extending to the sea, including the old Lodge/ Hotel/ Funeral Home and more recently used as the New Jewel Party headquarters in the early days of the revolution; together with the old Library building, and of course Melrose House and the adjoining Court House on the sea side of Depradine Street. Nothing will happen without funding. 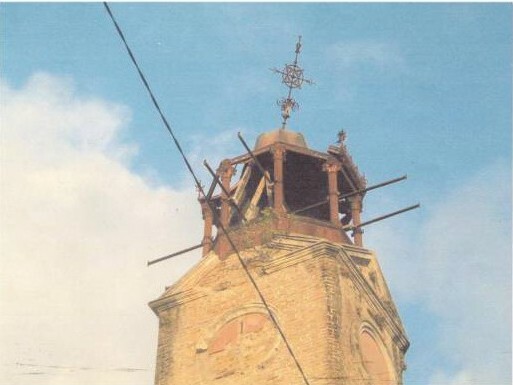 Gouyavarians and the Grenadian Heritage community both at home and in the diaspora are kindly requested to assist to make the repairs to the steeple a reality which could be the beginning of a heritage renaissance with its economic spin-off, in the town that never sleeps. Contributions could be made to Dr Vincent at George.Vincent@live.com or via our DONATE BUTTON @ www.willieredheadfoundation.org or by ringing telephone (473) 405-4012.